E3 gets its fair share of celebrities ever year. This year alone, we’ve run into a variety of talents from Indiana Pacers center Roy Hibbert to B-list comedians like Orlando Jones from MadTV fame. However, the biggest name in attendance was actually outside of the Los Angeles Convention Center and at Qualcomm’s booth. Oh course we mean Pacific Rim director Guillermo del Toro. The man behind fan favorites like Blade II, Pan’s Labyrinth, and the Hellboy series paid a visit to the mobile processing giant’s stage to present an exclusive look at his Kaiju-inspired action flick. 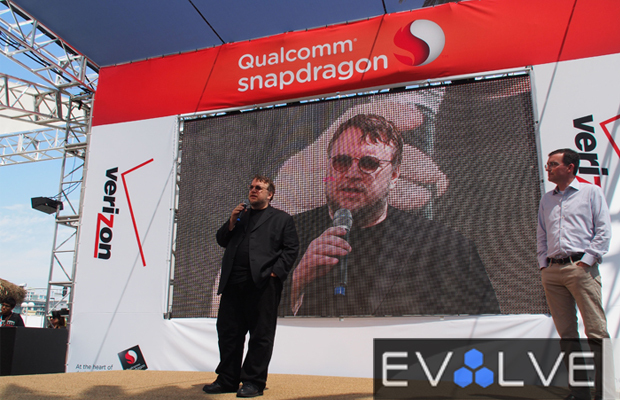 Guillermo was dear enough to discuss some of the development techniques used to bring the movie’s big fight scenes to life, while showing a humorous side by poking fun of his special gift from Qualcomm, a portrait created by world-renowned artist David Garibaldi, stating “I look like a drug-dealing Michael Moore.” LOL. Well said, Guillermo. Watch our exclusive footage from the Qualcomm booth at E3 2013.